Discussion in 'GOAL Training/Education' started by jeffwatch, Nov 12, 2018. Unthinkable lecture held inside of clubhouse, round banquet tables with padded stackable chairs. Approx. 30-40 people attended. The age range of attendees: 13 (my daughter who attended w/ me) to women and men in their 60’s. A very comfortable environment for a clubhouse on a gun range. This was an amazing/eye-opening experience/class! There was so much information moving so fast that I absolutely need, and will take this class again. I think everyone that walks among people NEEDS to take this class. Their life will be safer once they understand there are people that do not think like us and will kill us in a flash without a second of remorse. Dr. Aprill is an outstanding speaker that kept the whole room engaged with facts, personal stories, interviews, and humor when needed. He is a very likable, soft-spoken dude. Some of the material was tough to digest, but Dr. Aprill had a way of making it make sense and tying it to the real world of the citizen defender. Do we know when we are being targeted? What are the selection traits VCA are looking for? What information are you broadcasting out to VCAs? VCA love of chaos mgmt. We deep dived into “thin slicing” and how a one's gait plays a ton into the VCA selection process. Got a crash course on facts of the mentally ill, and fallacies around the mentally ill, Fascinating stuff. 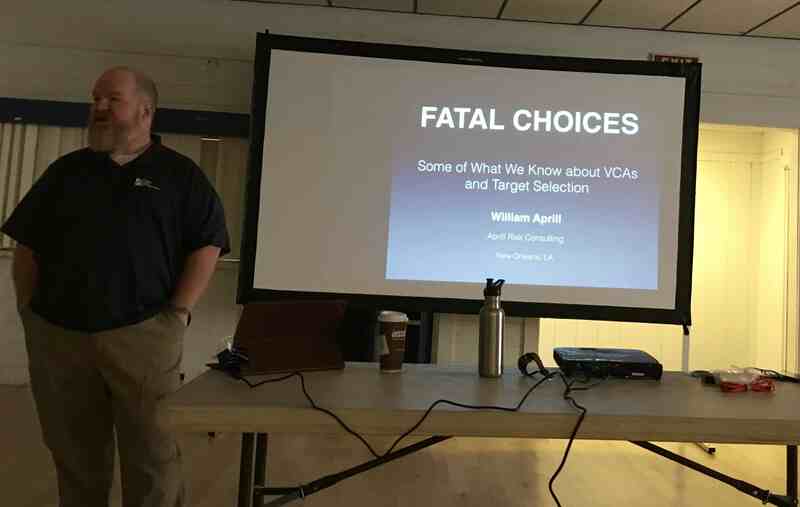 We spent a lot of time “trying to ”understand the VCA is not like us. Just because we think “normally” does not mean they think the same way, or have the same moral values. “You can’t opt out of someone else’s reality” We were shown example after example all day how VCA have their own code of ethics, morals and their complete disregard of human life. Understanding this is so important! VCAs live in a totally different world than we do. The last 30 minutes were tough, we watched videos and saw reports of awful things being done by VCAs to fellow human beings. There were times I looked away or shut my eyes at what we were watching. Made me very f***ing angry! Shown examples of bystanders just walking by and doing nothing when horrible things are being committed to children to a good citizen trying to save a woman being dragged away getting shot because he had no real plan when he walked up to the VCA doing his work. During one of the breaks, Dr. Aprill came over and spoke to my daughter, he gave her advice on fixed blade knives and placement on the belt center of her body. They had a bonding moment discussing their love and knowledge of knives…. “stab them in the face” Dr. Aprill was carrying a clinch pick he took it off and showed it to her and demonstrated the proper grip. First time I saw the clinch pick in person. It was A LOT SMALLER than I thought it was. The only thing that pissed me off was the gun club’s rules, No live ammo in the clubhouse. At check-in, the clubs FUZZ reminded me of this rule. I walked my magazines back to my car. REALLY? We are licensed to carry, we are trusted to be safe on the range, but a loaded gun in holsters is a NO NO NO NO NO! Makes no sense. He gave us his business card and told us to call him or email him with any questions. How awesome is that? How the citizen defender always has the disadvantage, as the VCA chooses the time and place of the ambush. Google FBI LEOKA: study how and why police officers were killed. Interesting fact: Most ppl are arrested for murder are on a substance, not cop killers, they are sober straight. No one is coming to save us. We fight with our edc, empty-handed skills and when we go we go 100% in. THANK YOU JOHN GREEN (@JGreen) OF GOAL FOR MAKING THIS HAPPEN! 4runner1443, jpk, Len-2A Training and 1 other person like this. I like this guy already - he doesn't flaunt his PhD on the intro slide. We ditched this rule at Hopkinton decades ago at the president's kitchen table. Current rules prohibit unholstering at any location other than a designated firing line. The sheer hypocrisy of it. I'll bet the people supporting the rule would be annoyed if their local police chief had the same attitude towards carry and issued a restricted LTC. Trusted to be "safe on the range" - really? How about trusted to be safe at the supermarket, mall, banks, medical facilities (signs do not have the force of law) and the vast majority of police stations in MA? Such a rule encourages unloading upon arrival and re-loading upon departure, thus increasing the chances of a ND. Len-2A Training and jeffwatch like this. In my experience, Dr. William Aprill's class is very worth the time and cost! It's very helpful to understand the thought processes of the people who could be attacking you. Hopefully he does another class in our area soon.